We’d love your help. 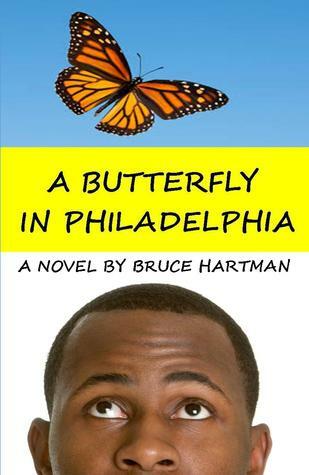 Let us know what’s wrong with this preview of A Butterfly in Philadelphia by Bruce Hartman. Spencer Casey is a 20-year-old high school dropout who works in a failing puzzle factory in Philadelphia, chopping up Masterpieces of Western Art into jigsaw puzzles. He is tired of being an effect instead of a cause. On the night before the factory is to close, inspired by the image of a butterfly flapping its wings in China, he scrambles the pieces of a painting called “Chaos Scape 19” and sends his own ripples of chaos into the world. To ask other readers questions about A Butterfly in Philadelphia, please sign up. A Butterfly in Philadelphia follows the stories of a handful of people who are forever changed by Spencer’s small act of rebellion. Hartman does an excellent job merging third-person narration with first-person, journal-type entries to really bring the characters to life. The story is far more complex than the cover would suggest and I often found myself wondering if it was even possible that it would all come together in the end. Everything did come together, and it did so in a very satisfying way. The wonderfully ironic subplots, some of which I had forgotten about, all found their way back into the story, leaving me smiling at the outcome. A Butterfly in Philadelphia is a witty, clever, well-written story that should be at the top of your ‘must read’ list. This book is a lot of fun. It reminds me a bit of Confederacy of Dunces in that it's a fast paced story with a multitude of colorful characters and quite a few laugh out loud moments. I didn't think it was a masterpiece in the same way that Dunces was, but I thoroughly enjoyed it and would recommend it to others looking for a solid comedic story. Clever story with some good messages. Lots of characters that are pretty well developed. Didn't really care for all the negative stereotyping of overweight people, but overall, a decent book. Moving on, this novel reads like slapstick. A satirical comedy to find your fuunybone. I wanted to like this one...I've enjoyed this author's books in the past. There were some quirky characters that I found interesting, but I just kept drifting away....it could have been the timing. Life got busy, and I just never made it back into this story. I may pick it up again one day, and give it another go. This is really a train wreck of a story: workers in a puzzle factory discover the far-reaching consequences of their actions when they scramble different jigsaw puzzles in the same boxes. The situations were so implausible that they almost became plausible again. I picked it up because Amazon reviews referenced the local color, but that wasn't enough to redeem this very strange novel. A Butterfly in Philadelphia was a good light read for vacation. Sounds like there may be more of these stories about Spencer by the way the book ends. It was certainly a different way of writing from so many different viewpoints. This is the first non-mystery novel I have published. It's a satirical comic novel and at the same time a coming of age story, though not YA fiction because of some of the themes. Since I wrote it, all I can say is: Highly recommended! Bruce Hartman has worked as a pianist, bookseller and attorney. The author of eight novels, he lives with his wife in Philadelphia. His eighth novel, a legal thriller entitled THE DEVIL'S CHAPLAIN, was released in May, 2018. This book tells the story of a young attorney, Charlotte Ambler, who volunteers to represent a death row inmate, a once-prominent biologist named Christopher Ritter, who assert Bruce Hartman has worked as a pianist, bookseller and attorney. The author of eight novels, he lives with his wife in Philadelphia. His eighth novel, a legal thriller entitled THE DEVIL'S CHAPLAIN, was released in May, 2018. This book tells the story of a young attorney, Charlotte Ambler, who volunteers to represent a death row inmate, a once-prominent biologist named Christopher Ritter, who asserts his innocence but doesn’t regard his life as worth saving. Charlotte fights to save him in spite of himself as the clock ticks toward the execution date. In this gripping tale of deception and self-deception, betrayal and violence, lawyer and client find common ground in their quest for justice and human values. "Brilliant!... It is one of the finest depictions of evil I have ever read and is a superb depiction of manipulation.... It is also a highly entertaining mystery with a heroine as compelling as she is gutsy." Bruce Hartman's seventh novel, POTLATCH, a satirical comedy in the tradition of Kurt Vonnegut, was published in 2017. It is the second book in a projected "Philadelphia Trilogy" of which the first book was A BUTTERFLY IN PHILADELPHIA. Lisa McCombs, writing for Readers' Favorite Book Reviews, gave POTLATCH five stars and called it "hilarious... one of the most amusing reads ever to be published." The first book in the trilogy, A BUTTERFLY IN PHILADELPHIA, has garnered a following on Amazon, sometimes reaching No. 3 on the paid best-seller list for literary satire. Readers' Favorite Book Reviews gave the book Five Stars and called it "one of the strange comic masterpieces that you're quite lucky to run across once in a very great while." POTLATCH follows another comic novel, BIG DATA IS WATCHING YOU!, a satirical techno-dystopia set in a future in which the all-powerful force of Big Data rules humanity through the Internet of Things and the corporate power of the FANGs. It is the story of how one defiant customer foils the conspiracy to delete humanity from Google Earth. Bruce Hartman's previous four novels were mysteries. The first one, PERFECTLY HEALTHY MAN DROPS DEAD, won the Salvo Press Mystery Novel Award and was published by Salvo Press in 2008. His second book, THE RULES OF DREAMING, was published by Swallow Tail Press in 2013. Kirkus Reviews selected THE RULES OF DREAMING as one of its "Top 100 Indie Books of 2013." Another mystery, THE MUSE OF VIOLENCE, was also released in2013. THE PHILOSOPHICAL DETECTIVE, subtitled "The True Story of An Imaginary Gentleman," was published in 2014. It explores the boundary between literary fiction and the mystery genre - and as always in Hartman's fiction, between fiction and reality.